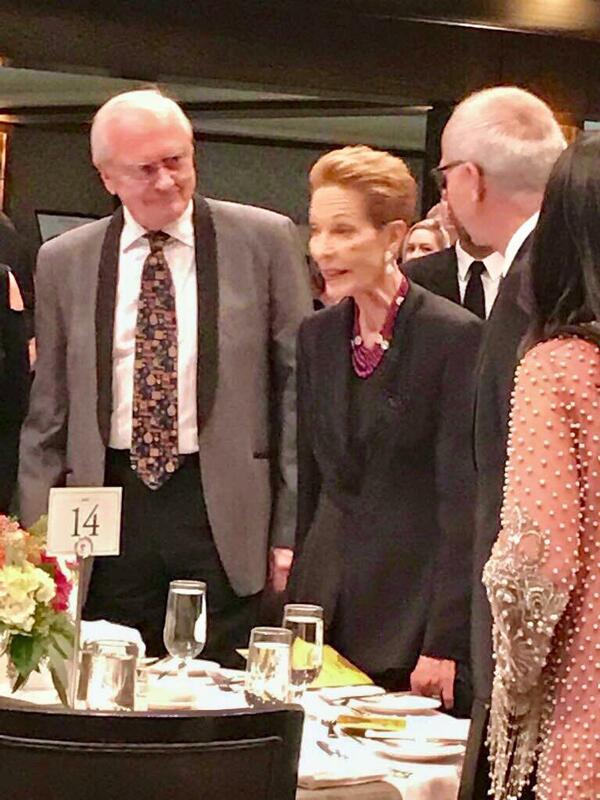 Toronto, 2017, October 20 - Marigold Gala Fundraising Campaign for SOS Children Villages with Princess Salimah Aga Khan, mother of Prince Rahim, Princess Zahra and Prince Hussain. Princess Salimah is Ambassador of SOS Village d'Enfants, a charity dedicated in giving a family like surrounding to orphan children. I was very pleased to see postings on current activities of Begum Salimah. This show our respect and honor for an esteemed person. As a true Ismaili you demonstrated your character ,depth and broadness of thoughts to have it published on your website. May ALI bless in your effort. 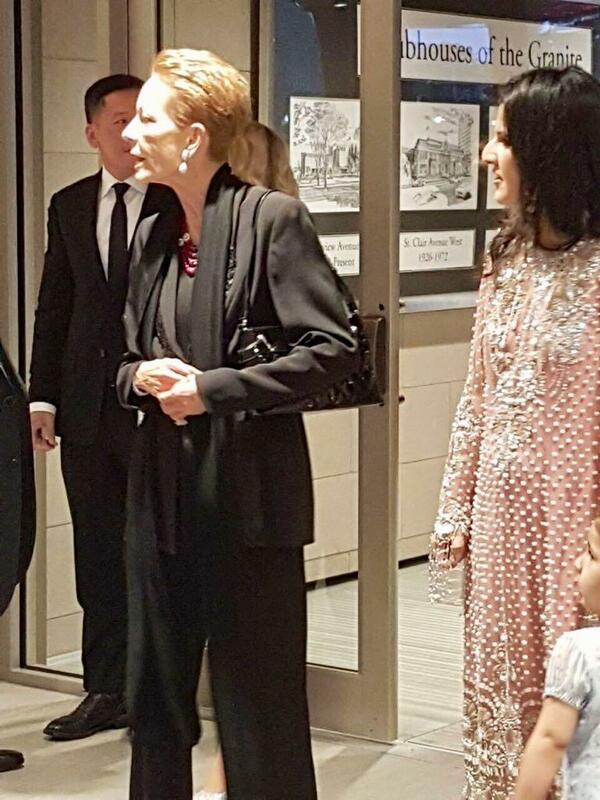 Last night Noorbanu had the joy of meeting Her Highness, Princess Salimah, Aga Khan and gifting her a few A Spicy Touch cookbooks . 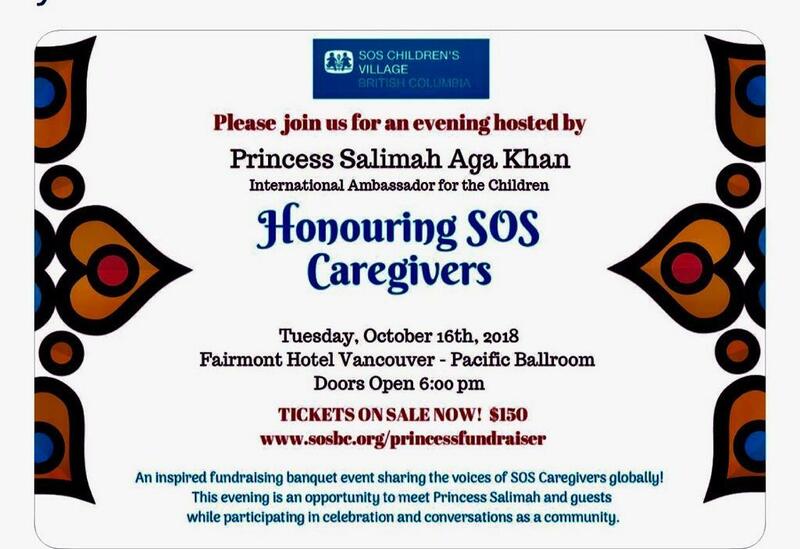 Princess Salimah was in Calgary in her role as the SOS Children's Villages Global Ambassador for Children. And together with Special Representatives of SOS Children’s Villages, she hosted an evening of learning, fundraising and community building for Ugandan girls. 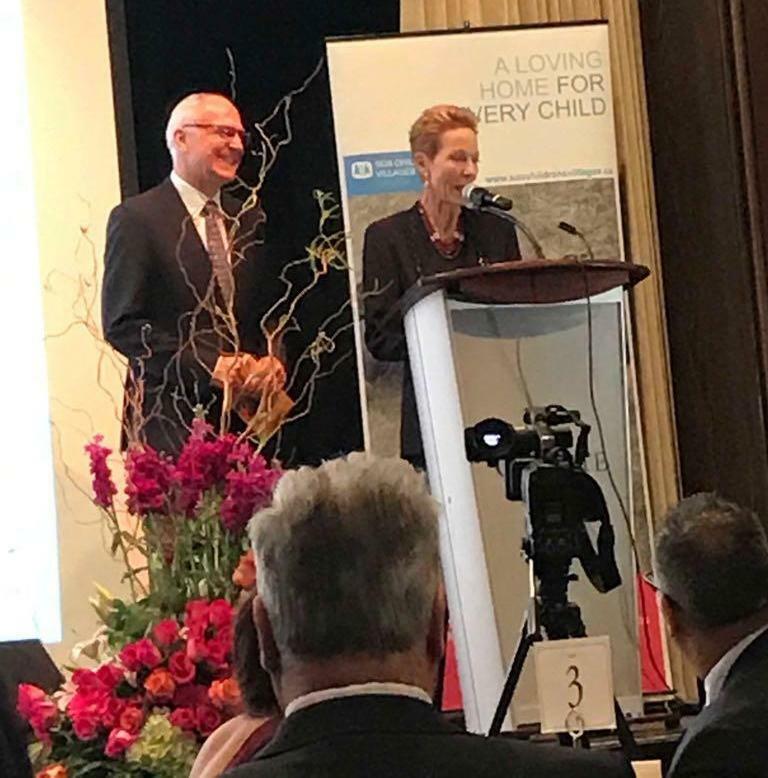 For more than 20 years, Princess Salimah, Aga Khan has been a passionate champion for the work of SOS Children's Villages and has witnessed first-hand SOS’ efforts to protect and care for orphaned, abandoned and neglected children. There is much work to do in the way of investing in Ugandan girls. Due to the educational gender gap, girls in Uganda are at a greater risk of suffering from poverty due to intermittent schooling, or absenteeism. Through SOS Children's Villages " Ugandan Girls Project" robust interventions have been developed to break barriers that prohibit girls from completing their education. The funds raised through this event, will support SOS Children's Villages increase access, attendance, retention and education completion among 2000 girls living in the most marganilized communities in Uganda. Noorbanu was born and raised in Nairobi, Kenya in East Africa and was happy to attend and support this cause. Thx to Noorbanu’s granddaughter Soraya Mohamed for the great photos. WESTLAKE VILLAGE, Calif.--(BUSINESS WIRE)--The Conrad N. Hilton Foundation today announced that Leymah Gbowee, Nobel prize recipient and founder and president of the Gbowee Peace Foundation Africa based in Liberia, and Zainab Salbi, global humanitarian and founder of Women for Women International, will join the Conrad N. Hilton Humanitarian Prize jury, beginning with the selection of the 2019 recipient. Gbowee and Salbi become jurors as Strive Masiyiwa, humanitarian and founder and executive chairman of Econet Wireless, and Princess Salimah Aga Khan, international ambassador for SOS Kinderdof International, complete their terms. 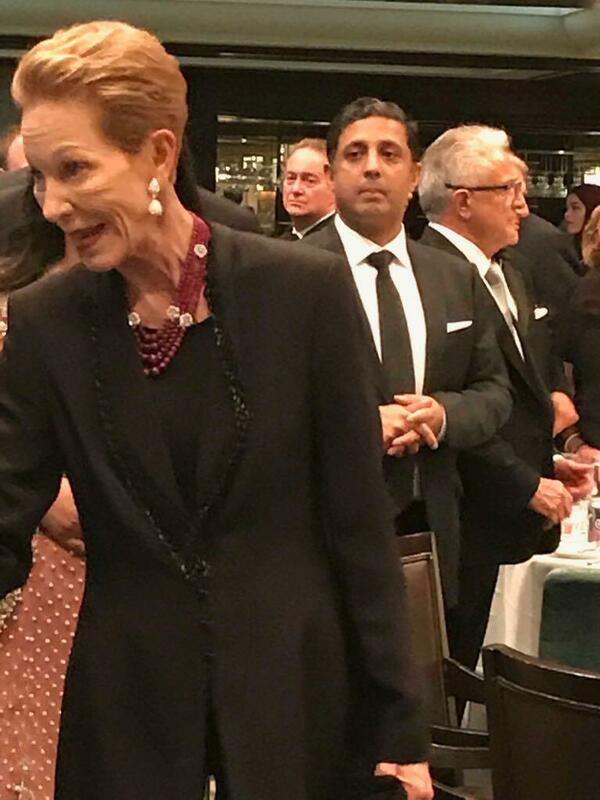 The Hilton Humanitarian Prize is the world’s largest annual humanitarian award at $2 million, presented to nonprofit organizations judged to have made extraordinary contributions toward alleviating human suffering. To date, 23 NGOs have been named Hilton Humanitarian Prize laureates. Gbowee brings with her an esteemed background full of achievement. In 2011, Gbowee won the Nobel Peace Prize for her leadership in the women’s peace movement that helped end the Second Liberian Civil War. She was behind the mobilization of an interreligious coalition called the “Women of Liberia Mass Action for Peace” movement, which played an instrumental role in encouraging women to take part in nonviolent protests and more to promote peace in the region. Gbowee is a global leader whose participation was in demand at meetings of the United Nations Commission on the Status of Women and other major international conferences. She went on to found Gbowee Peace Foundation Africa, which seeks to provide leadership and education opportunities across Africa. Gbowee’s story was featured in the 2008 documentary film Pray the Devil Back to Hell and her 2011 memoir, Mighty Be Our Powers. Salbi’s achievements have been recognized by numerous organizations, including People Magazine naming her as one of the “25 Women Changing the World” in 2016, Foreign Policy Magazine naming her as one of the “100 Leading Global Thinkers,” and Fast Company identifying her as one of the 100 “Most Creative People in Business.” Salbi is a best-selling author of such books as Between Two Worlds: Escape from Tyranny: Growing Up in the Shadow of Saddam, If You Knew Me You Would Care, and her latest Freedom is an Inside Job. She is also the host and creator of several TV shows, including #MeToo, Now What? on PBS and a new original series with Yahoo News! Through Her Eyes with Zainab Salbi. Early in her career, at age 23, Salbi founded 2006 Hilton Humanitarian Prize laureate Women for Women International, a grassroots humanitarian and development organization dedicated to serving women survivors of wars. The organization offers support, tools, and access to life-changing skills to move from crisis and poverty to stability and economic self-sufficiency. Under her leadership, Women for Women International grew from helping 30 women upon its inception to more than 420,000 women in eight conflict areas and has also distributed more than $120 million in direct aid and microcredit loans that impacted more than 1.7 million family members. As the two new jurors come aboard, Princess Salimah Aga Khan and Strive Masiyiwa will complete their jury service. 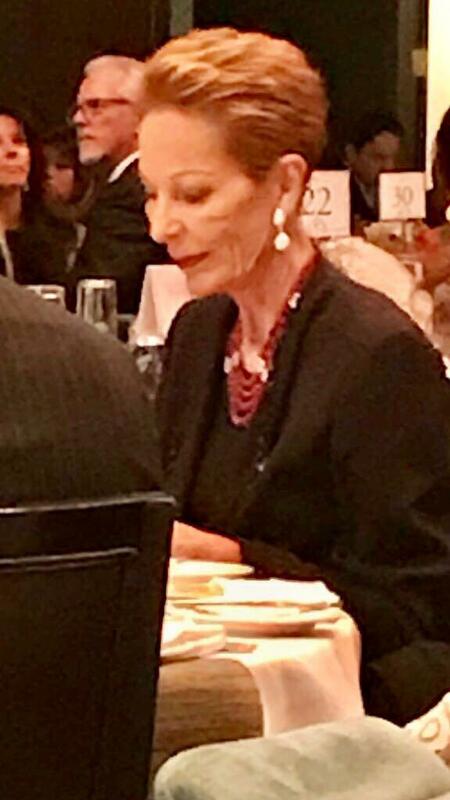 Princess Salimah Aga Khan was appointed in 2000 as the first SOS-Kinderdorf International Ambassador for Children, itself a Hilton Humanitarian Prize laureate, and is actively involved in that organization’s work. Masiyiwa is the founder and executive chairman of Econet Wireless, a global telecommunications company whose activities include mobile cellular telephony, fixed networks, enterprise networks, fiber optic cables and satellite services. Recent recipients of the Conrad N. Hilton Humanitarian Prize include SHOFCO (Shining Hope for Communities), icddr,b and the Task Force for Global Health. A list of all Hilton Humanitarian Prize laureates can be found here. The Conrad N. Hilton Foundation was created in 1944 by international business pioneer Conrad N. Hilton, who founded Hilton Hotels and left his fortune to help the world’s disadvantaged and vulnerable people. The Foundation invests in 11 program areas, including providing access to safe water, supporting transition age foster youth, ending chronic homelessness, hospitality workforce development, disaster relief and recovery, helping young children affected by HIV and AIDS, and supporting the work of Catholic sisters. In addition, following selection by an independent international jury, the Foundation annually awards the $2 million Conrad N. Hilton Humanitarian Prize to a nonprofit organization doing extraordinary work to reduce human suffering. In 2018, the Hilton Humanitarian Prize was awarded to SHOFCO (Shining Hope for Communities), a grassroots organization based in Nairobi, Kenya that catalyzes large-scale transformation in urban slums by providing critical services for all, community advocacy platforms, and education and leadership development for women and girls. From its inception, the Foundation has awarded more than $1.7 billion in grants, distributing $112.5 million in the U.S. and around the world in 2018. The Foundation’s current assets are approximately $2.6 billion. For more information, please visit www.hiltonfoundation.org.